It has been a busy week. Yesterday EWTN’s “The World Over” that will be repeated three more times this week. It was a good time with Raymond and the segment flew by. 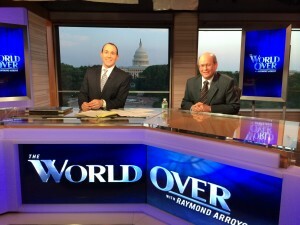 All his staff and producers were wonderful.You can find out more here www.ewtn.com/tv/live/worldover.asp. Let me know below what you think of the shows, the Pope’s visit to the Holy Land and what you hope he accomplishes.